If you haven’t already done so this is your last chance to check out the third of three iterations of the Design in Depth mural of 17 posters at the Notre Dame Campus of Red River College (it comes down next Monday, Oct. 29) and latest version (3.1.1) of the rolling PowerPoint presentation with some 61 new slides (in a grand total of 254) from the last version (3.1) released at the end of August. FYI, the PDF link in this blog represents this same rolling PowerPoint presentation. Besides adding beauty and colour to anyone’s life, such art posters would have particular interest to the College’s Graphic Arts students who learn about what goes into choosing the design elements (such as font, colour, background, position, etc.) into what message is communicated. As the most quoted thinker in the exhibit, Marshall McLuhan, famously observed, “The medium is the message.” Like body language, often much more is communicated by the way things are presented rather than by the content of the individual messages themselves. This is true even when the art is the “same”, but presented digitally versus its print format. 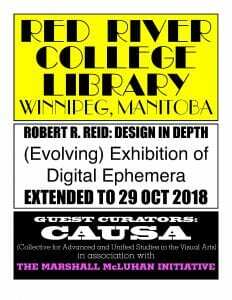 From late June through September, RED RIVER COLLEGE LIBRARY is hosting an evolving exhibition of thought-provoking ‘digital ephemera’ (recently realized) by pioneering Canadian typographical designer Robert R. Reid. Presented by CAUSA (Collective for Advanced and Unified Studies in the Visual Arts) –in association with the MARSHALL McLUHAN INITIATIVE– the exhibition ROBERT R. REID: DESIGN IN DEPTH presents a vast (purposefully selected) cross-cultural and transgenerational assemblage of literary/philosophical texts (including documents in translation from the Chinese, French, German, Italian, Japanese, Korean and Welsh). The ‘intermittently appearing’ content of this Red River College library program comprises epigrams and revelatory quotations (from 5th century BCE to 2018), selected by CAUSA Research Curators and typographically designed by Robert R. Reid. This collaborative project consistently introduces/re-introduces its curatorial purpose as an ongoing experiment: ‘revivification’ of CULTURAL MEMORY through ‘close’ reading … ‘observation and discernment’ of continuously capacious ‘potentialities’ within the pending (abstract/real) domain of CONTEMPORANEITY itself. In that regard, CAUSA research curators have noted: “Robert R. Reid’s design practice sustains a digital-experimental typographer’s ‘teleportation presence’ –and a mindful/regenerative GLOBAL VILLAGE AESTHETIC. Reid’s Red River College exhibition coincides with the 19th Annual Convention of the Media Ecology Association –The University of Maine, 21-24 June)– functioning this year in relation to the theme SENSES OF TIME, SPACE AND PLACE. 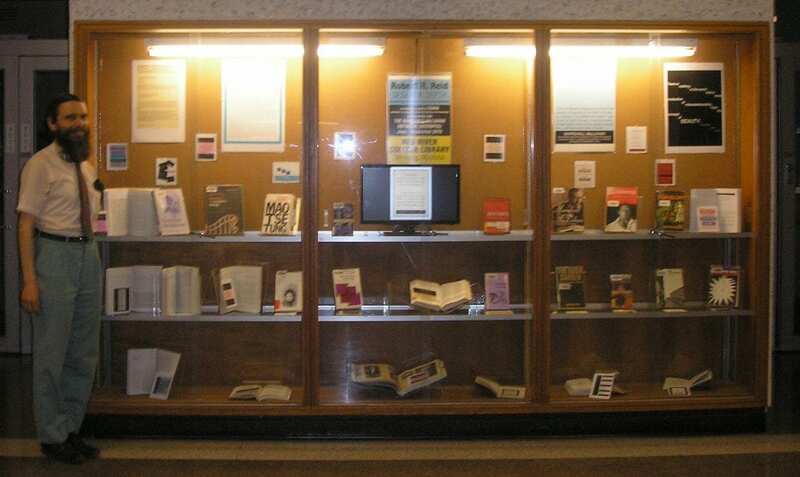 Last November, a CAUSA exhibition of both books and digital ephemera (designed by Reid during the period 1949-2017) was installed at Thomas Fisher Rare Books Library, University of Toronto –in tandem with the UNESCO announcement of its MEMORY OF THE WORLD citation for the comprehensive Marshall McLuham holdings at that venerable institution. The current Robert R. Reid exhibition coincides, also, with the 16th INTERNATIONAL ARCHITECTURE EXHIBITION 2018 [BIENNALE ARCHITETTURE], Venice. The biennale curators have recently commented: “We see architecture as the translation of need in its widest sense into meaningful space.” In that sense, the Red River College Library DESIGN IN DEPTH exhibition connects coherently to a CAUSA/UNIVERSITY OF MANITOBA symposium (realized earlier this year): MARSHALL McLUHAN: WINNIPEG / WORLD. The same digital presentation is concurrently running at the John and Bonnie Buhler Library at the Exchange District Campus. The second installation consists of a mural of 17 posters inside the Library. 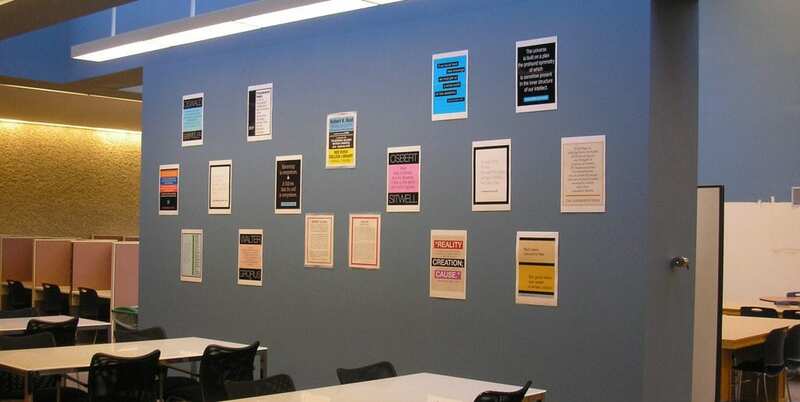 There are 14 printed posters in groups of 7 that cluster beside a title poster and two introductory panels of the artist, Robert R. Reid, and the CAUSA guest curators. The 14 posters will be refreshed twice throughout the summer at around the beginning of August and again around the beginning of September. After the window presentation is taken down on August 15, the digital presentation component will migrate to be near the mural of larger posters. Precisely through its artistic aesthetic, herein lies a prime example of an old technology, typography, becoming in its obsolescence a new art form, as the McLuhans probed through their tetrad of media effects. Having further clarified his aesthetic conviction by teaching printing and graphic design at the Vancouver School of Art (now the Emily Carr University of Art + Design) from 1957 to 1962, Reid moved to Montreal—where he functioned as Director of Design and Production for McGill University Press. Subsequently, before returning to Vancouver in 1997, he was active for 23 years as a publisher in New York City. The digital ephemera comprising Robert R. Reid’s current exhibition at Red River College Library results from his digital design practice during the past three years. Developing from affiliations with the Free International University for Creativity and interdisciplinary Research (as initiated by Joseph Beuys and Heinrich Böll), CAUSA –Collective for Advanced and Unified Studies in the Visual Arts– aims to develop autonomous interpretation of visual culture within specific historical contexts. CAUSA functions in association with a ‘global village’ network of independent and institutional scholars –in tandem with a pluralistic community of socially engaged contemporary artists.